The future development of Bavaria is taking clear shape: The yacht builder, respected worldwide for its good price-performance ratio, will once again build its boats one hundred percent in Germany. Bearing the seal of quality “Made in Giebelstadt”, both sailing and motor yachts will be manufactured and handed over to customers in Franconia. The R55 motor yacht, previously produced in Croatia, will for the first time be hand-built at the company’s headquarters in the first half of 2019. The molds and tools are currently being transported from Croatia to Germany and installed in Giebelstadt. “We want our outstandingly well trained and committed employees to develop and build all our yachts primarily under own management. The workforce identifies strongly with Bavaria Yachts; it is the key feature of our company,” explains Managing Director Erik Appel, who has been Chief Operating Officer of Bavaria Yachts since December 2017. “This is why we intend to further increase our permanent staff and simultaneously reduce the proportion of temporary workers. This will help considerably to bring down production costs. To increase the efficiency of the shipyard, we will concentrate on our own engineering, i.e. the technical development of yachts, at Bavaria Yachts once again. Interdisciplinary teams have already been formed. We will organise the handover of newly developed models from engineering to production better and thus reduce costs. Engineering and joinery will continue to be core in-house competences.” The series production that Bavaria Yachts stands for is being taken to new levels. To do this, it will be necessary to greatly reduce the complexity that has emerged in recent years. The current portfolio includes 26 models within the next three years it is to be focused on 10 to 12 models which are efficient and popular in the market. “Our model range will be more attractive and at the same time of a highly reliable quality, with a portfolio of the same size,” adds Erik Appel. Ferretti Group announced the grand opening of its new marvelous showroom in Shanghai at the Bellagio Hotel. This new opening confirms the strategy of international growth of Ferretti Group, and its goal to increase visibility in the Asia-Pacific market. Ferretti Group brand new showroom is located in the shopping section on the first floor of Bellagio Shanghai. It perfectly mirrors the elegant taste, the international excellence and Italian aesthetics of the Group. At this showroom, visitors will see the impressive scale models of the latest yacht models presented from the Group’s portfolio of legendary brands, such as Riva 110’ Dolcevita debuted last month during Cannes Yachting Festival, Pershing 140 to be debuted in year 2019, and 74M mega yacht Cloud 9 from CRN brand which was delivered to her owner last year. These new projects are benchmarks of cutting-edge design and technology innovation in the global nautical world. Showroom visitors can also learn about the history and heritage of all seven brands from the interactive touchscreen totem. “The new grand opening confirms, once again, Ferretti Group’s commitment to further expand in continental China, next to positioning all brands in a selective market, that is definitely strategic in the luxury field” comments Stefano De Vivo, CCO of Ferretti Group. The grand opening saw the participation of distinguished guests such as Mr. Bartolomeo Lamonarca, the Italian Consul Shanghai, Mr. Alain Tsui, the General Manager of Bellagio Shanghai, general managers of yacht clubs from East China, publishers of China’s top lifestyle magazine, partners of Ferretti Group from various sectors in the luxury industry, and successful entrepreneurs and boat owners. Mr. Alessandro Tirelli, Sales Director of Ferretti Group Asia Pacific shared the Ferretti Group’s latest achievements, new fleet, and new vision for the Chinese market, as well as exciting news from the September Cannes Yachting Festival and Monaco Yacht Show. Horizon Yachts is pleased to announce Denison Yacht Sales has joined the company’s extensive Preferred Partner sales network, representing Horizon’s luxury yacht collection in California. Denison Yacht Sales will work directly with Jim McLaren at Orange Coast Yacht Sales, the current Horizon Preferred Partner located in Newport Beach, to ensure a smooth and seamless transition as Mr. McLaren retires from the industry. Bill Palmer and David Millett, of Denison’s Newport Beach office, are named as the company’s Brand Representatives for Horizon luxury yacht enquiries in California. Denison Yacht Sales has long been a leader in the yachting industry with a rich family history dating back to 1948, with the start of Broward Marine in Fort Lauderdale. Today, the company provides complete yachting services worldwide, from sales and charter to crew placement and new construction. Denison has 22 waterfront offices from coast to coast around the U.S. as well as a team of nearly 100 licensed and bonded yacht brokers. Decades of experience provide a long-term perspective on the industry, extensive industry contacts, a deep client roster and a passion for yachting. Maritimo Wants You, That's the message that Australia's leading luxury motor yacht manufacturer Maritimo is spreading throughout Australia and New Zealand as it seeks to significantly increase its workforce to meet unprecedented demand for its luxury boats. Riding a wave of success that has seen it sell luxury motor yachts worth many tens of millions of dollars this year the Gold Coast based company is expanding its facilities and production capacity. CEO Garth Corbitt said with the production pipeline now stretching out to 2020, the company’s supply capacity requires ramping up to meet demand. "We have had a phenomenal year with tremendous sales success and the task at hand now is to get the boats built," he said. "We have steadily increased our workforce over the year, but we are still employing at all fields within the manufacturing areas of the company.” Maritimo's Production Manager, Kym Fleet, said Maritimo needs experienced and motivated people with a minimum of three years experience in the industry. "We are employing high skilled people in lamination, cabinet making, fit-out, engineering, varnish and stainless fabrication, all of whom we desire a keen eye and attention to detail," he said. "We are putting out the word throughout Australia and also in New Zealand." "Successful applicants will be working in our Coomera based manufacturing facility on the Gold Coast and they will be part of a team producing the country’s leading state of the art luxury motor yachts that are in demand around the globe." He said the Gold Coast was Australia's sixth largest city and the largest non-capital with an enviable lifestyle and annual tourism visitors exceeding 12 million people. "The allure of the Gold Coast's lifestyle with its 57 kilometres of pristine coastline, 260 kilometres of navigable waterways and relatively small population base of approximately 576,000 people makes it one of the best places in the world to live," said Fleet. "The Gold Coast has established itself as the natural hub for the country's marine industry and in terms of global livability standards we rank right up there so the opportunity to join Maritimo and enjoy such a lifestyle is something we believe will be very attractive to interstate and overseas residents." Maritimo says it will continue its hiring campaign until the appropriate numbers are met. Leading Australian luxury motor yacht manufacturer, Maritimo, has continued to expand its reach in the Americas with yet another appointment of a multi-generational marine broker as a dealer partner. Maritimo Americas' President, Dave Northrop, said he was delighted to have B & E Marine from Michigan City, Indiana join the Maritimo network saying the second generation business, established in 1953, was one of the most successful and respected in the USA. "B & E Marine and the Bensz family have an excellent reputation for professionalism, customer service, dedication and boating knowledge," he said. "The firm has represented some of the biggest and most successful brands in the country and we are sure the Maritimo brand and awareness will be greatly enhanced as a result of their involvement." The appointment of B & E Marine as a dealer partner is the latest move in Maritimo's establishment of a network of highly professional and experienced representatives of the brand in the Americas. B & E Marine, located on Lake Michigan in Michigan City, IN is only 38 miles from Chicago by water and has been in business for over 65 years. From its beginning, the company has shown a commitment to the boating lifestyle, its clients, its team members and its community that is the cornerstone of its operations right up to the present. Co-Founder, Ronald Bensz established the company in 1953 with his friend Rolland Evett. A few years later he became sole owner and eventually sold the business to his two sons in the mid-1980's. Barry and Rod Bensz have continued in their father’s footsteps to foster the company's commitment to excellence and community involvement. They are both involved in numerous industry and local community groups. "Our team actively works each day to provide our clients with quality products, excellent service and to introduce people to the boating lifestyle in an effort to make our boating area one of the best in the country," said Rod Bensz, B & E's co-owner and director of sales. He said the opportunity to become involved with Maritimo was exciting and he was confident strong sales would result as more boaters became aware of the brand and its various models. "The climate controlled flybridge motor yachts will resonate well with boaters in our area and the exciting new X-series which has changed the world of sport yachts internationally, will also prove to be very popular I am sure," he said. Maritimo's CEO, Garth Corbitt, said the appointment of B & E Marine added yet another layer to Maritimo's international outreach. "Our markets in Australia, New Zealand and South East Asia are firing and we are committed to increasing our reach in the Americas and also in Europe," he said. "Forward orders now stretch out to 2020 and we have embarked on a major employment drive seeking to increase our current workforce by approximately 30 percent to help us meet the demand for our vessels. "Maritimo's reputation internationally is gaining momentum and the Americas is an exciting market for us to be active in." Northrop said Maritimo's build quality and sea worthiness, being designed to handle some of the most challenging ocean conditions in the world around Australia, resonated strongly with US boaters. "We are extremely excited about Maritimo's future here and the appointment of top flight operators such as B & E Marine will add to our momentum," he said. "It is fair to say that the response from our customers to the revolutionary X60 sport yacht and the new generation of flybridge motor yachts has been over whelming and with professionals like B & E Marine helping us increase the awareness of the brand globally the future looks extremely bright." Leading Australian luxury motor yacht manufacturer, Maritimo, has expanded its reach in the Americas with Colony Marine, one of the largest dealers in The Great Lakes, being appointed as a dealer partner. Maritimo Americas' President, Dave Northrop, said he was delighted to have Colony Marine join the Maritimo network saying the third generation business, established in 1958, was one of the most successful and respected in the USA. "Colony Marine and the Beauregard family have an excellent reputation for professionalism, customer service, dedication and boating knowledge," he said. "The firm has represented some of the biggest and most successful brands in the country and we are sure the Maritimo brand and awareness will be greatly enhanced as a result of their involvement." Colony Marine's President/Owner Pete Beauregard said the opportunity to become involved with Maritimo was exciting and he was confident strong sales would result as more boaters became aware of the brand and its various models. "The climate controlled flybridge motor yachts will resonate well with boaters in our area and the exciting new X range, which has changed the world of sport yachts internationally, will also prove popular I am sure," he said. "The X series with the X60 and X50 now revealed and other models to follow will do very well." Maritimo's CEO, Garth Corbitt, said the appointment of Colony Marine added yet another layer to Maritimo's international outreach. "Our markets in Australia, New Zealand and South East Asia are firing and we are committed to increasing our reach in the Americas and also in Europe," he said. "Forward orders now stretch out to 2020 and we have embarked on a major employment drive seeking to increase our current workforce by approximately 30 percent, to help us meet the demand for our vessels. "Maritimo's reputation internationally is gaining momentum and the Americas is an exciting market for us to be active in. "We have been actively rolling out a strategy to appoint the very best dealer partners possible throughout the Americas and the appointment of Colony Marine is a significant step forward in that process." Northrop said Maritimo's build quality and sea worthiness, being designed to handle some of the most challenging ocean conditions in the world around Australia, resonated strongly with US boaters. "We are extremely excited about Maritimo's future here and the appointment of top flight operators such as Colony Marine will add to our momentum," he said. Australia's leading luxury motor yacht manufacturer, Maritimo, continues to ride a wave of success with its recent X Series sports yacht releases and recent design upgrades to M Series Flybridge Motor yacht range, creating such demand that the Auckland On Water Boat Show provided more than $10 million in contracts finalised. The X60 Sport Yacht which premiered in May, and the X50 Sport Yacht scheduled for world premiere in 2019 were the highlights of the Maritimo display with both models generating multiple sales. Maritimo's lead designer, Tom Barry-Cotter, said the X50, which will have its international debut at the Sanctuary Cove International Boat Show in May 2019, has generated unprecedented amounts of interest due to its superior accommodation options and incredible price point. The X50 is creating momentum with its accommodative spaces blitzing competitor layouts in terms of accommodation area offered, and available accommodation options, made possible by the X-Series ground breaking aft cabin design. Barry-Cotter said X60 that was featured on the Maritimo display, had travelled from Australia to New Zealand under its own power, A route being chosen more frequently by owner’s as a less expensive and more exciting delivery option than via shipping delivery. The Auckland results follow on from highly successful sales results at both the Sydney and Sanctuary Cove shows, the latter seeing total sales of more than $40 million recorded. The Auckland show attendance figures were up 12 percent on previous years according to organisers who said it was one of the best shows ever held. The record sales success of 2018 Sanctuary Cove and Auckland Boat Shows forms a strong platform and confidence as Maritimo eagerly await the X Series North American premiere at Annapolis and Ft. Lauderdale Boat Shows in the coming weeks. Parlo Yachts is pleased to inform of an important management buyout operation, Fabio Planamente and Luigi Servidati, long-time managers of the company, have acquired the majority of Cantiere del Pardo Spa. With a capital increase of 5 million euros, the shipyard is ready to continue the growth and development of the Grand Soleil Yachts and Pardo Yachts brands. This operation has been overseen and finalized by LS Roma firm as financial consultant through its senior partner Riccardo Acernese. At the top of the new corporate structure there will be Luigi Servidati as President of the Administration Board and Fabio Planamente as CEO. Luigi Servidati and Fabio Planamente have been leading the shipyard since 2014 as managers. Both of them have been working in the company for many years, Servidati since 2000 and Planamente since 2009 performing different roles. In 2014, when Trevisani family entered as the majority shareholder of the shipyard, Luigi Servidati was appointed as Sales and Marketing Director and Product Development Manager, whereas Fabio Planamente as General Manager. During the last four years, Cantiere del Pardo regained its original leading role in the Boating Industry registering a revenue of more than 30 million euros this year. Such an accomplishment is a result of correct business decisions like the launch of the new powerboat brand Pardo Yachts as well as the new Long Cruise and Custom Line sailing range. Fabio Planamente and Luigi Servidati have commented on the latest news: “A special thanks from us and the whole shipyard goes to Trevisani family for their essential commitment and efforts in relaunching the company and for the support shown since their acquisition in 2014. 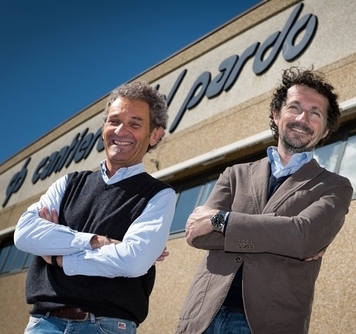 The investments and the strategic choices made will allow Cantiere del Pardo to reach new goals and become a reference in the Boating Industry”. The Trevisani family and Andrea Amadori have consequently reduced their holdings while maintaining their presence in the company. Malibu Boats, Inc. a leading global manufacturer of recreational fiberglass boats, announced today that it has closed the acquisition of Pursuit Boats (Pursuit) for total consideration of $100 million. “As a leader in the saltwater outboard fishing segment, Pursuit is an incredible addition to the Malibu family. Over the past 41 years, Pursuit Boats has established a premium brand through its incredible dealer network and longstanding commitment to customers. With Pursuit, we have an opportunity to broaden our outboard offering, while leveraging the manufacturing and design expertise of the respective teams to continue to deliver the premium products customers expect,” commented Jack Springer, Chief Executive Officer of Malibu Boats. “Pursuit Boats has established an unmatched premium brand through our incredible dealer network and longstanding commitment to customers. As a trailblazer in its own right, Malibu is the perfect partner, as we maintain similar cultures with a shared passion for product and people, which has driven our collective long-term success. The Slikkers family will continue to own and operate Tiara Yachts and Tiara Sport under the S2 Yachts corporate umbrella and are excited about that.” said Tom Slikkers, Chief Executive Officer of S2 Yachts. One of the world’s leading producers of yachts and superyachts, Sanlorenzo prepares to start a new important project for young people: “Sanlorenzo Academy”. Resulting from an idea by Cavalier Massimo Perotti, CEO and Chairmain at Sanlorenzo, who has once again shown the brand’s ability to look further and to enlarge its visions, Academy aims at creating specialised professionals whom the world of work currently lacks and needs, providing trainingopportunities for young people to get employed. This project was implemented thanks to a collaboration with the Italian training institution CISITA and to the support of Confindustria La Spezia, Region of Liguria, Alfa Liguria, Municipality of La Spezia and Port Authority. This initiative creates a major virtuous circle involving industry, education and the world of work, investing on new generations and fostering employment. Academy presents itself as a bridge between Liguria’s technical and professional schools and companies in order to introduce specialised professionals with technical and practical boating skills into the world of work. Both Sanlorenzo and the contractors involved in the project have committed to hire, at the end of the internship, 60% of the people enrolled in the Academy who will pass the final exam; this will earn them a temporary job contract for at least 6 months. The courses were presented yesterday at a press conference held at La Spezia’s Unione Industriale (Industrial Association) attended by Paolo Bertetti, engineer (Vice President Technical & R&D Sanlorenzo), Paolo Povesi (President of Cisita) and Francesca Cozzani (President of Confindustria La Spezia). The first course, that will start in mid-November, aims at training people in the production area and on board: - Polyvalent boating operator – training for 8 professionals with many skills suitable for all the stages of production processes; Sailor in charge of on-board technical equipment – training for 8 professionals with basic skills in the fields of plant engineering, engines and electronics and expert in typical on-board activities performed by sailors. The course will last 1 year, including 800 hours characterized by classroom and lab lessons and a 6-month internship. The final target is to provide students with technical and practical skills as well as “Soft skills” (managing stress, conflicts, criticalities, planning and communication skills etc), integrating their skills with specific knowledge and practical experience. More courses are being planned, starting in early 2019, to train new professionals including an installer/maintenance technician for boat plumbing appliances and Installer/maintenance technician for boat electric appliances. The project Sanlorenzo Academy was launched thanks to a European Union co-funding through donations from the Region of Liguria (European Social Fund 2014-2020). Determination, courage and the ability to enlarge one’s horizons are the ingredients of Sanlorenzo’s character, one of the world’s leading producers of yachts and superyachts, which embarked on a path toward new perspectives in the nautical world, thanks to chairman and Ceo Massimo Perotti’s entrepreneurial vision. Thus over the years Sanlorenzo has pushed its boundaries further and further, embracing languages and creative forms belonging to similar world such as design and art.This choice culminates with the company’s 60th anniversary and with a global partnership agreement with Art Basel, the leading art fair for modern and contemporary art, where the shipyard will be present for three years as exclusive partner in his sector. The annual events occur in Hong Kong in March, in Basel in June and Miami Beach in December up to 2020. Following Art Basel in Basel 2018, where Sanlorenzo presented the impressive installation at theCollectors Lounge as a tribute to Italian artist Emilio Isgrò, designed by the company’s art director Piero Lissoni, the company prepares to attend Art Basel Miami Beach 2018, from the 6th to the 9th December, with a new exhibition project in collaboration with Galleria Tornabuoni Arte signed by Lissoni. An actual excellence in the nautical world, Sanlorenzo keeps filling its DNA with art, proceeding on the path on which it embarked some years ago by collaborating with major Galleries and cultural institutions like Milan’s Triennale, on the occasion of FuoriSalone 2017 and 2018, and with Galleria Tornabuoni Arte, with which it set up some exhibitions on board some of its yachts, in concomitance with Art Basel Miami Beach in 2016 and Venice’s 57th Biennale D’Arte in 2017. For the second year in a row Sanlorenzo, one of the world’s leading shipyards for the production of yachts and superyachts, is included in the ADI Design Index, the volume that groups the best brands of Italian design selected by the ADI’s permanent Observatory of Design. Three of Sanlorenzo’s projects have been chosen by a commission composed of over 100 members including experts, designers, critics, historians, specialised journalists, who select the most outstanding proposals in terms of creativity and functional, typological innovation, production processes, materials, synthesis of form: the installation “Il mare a Milano” set up at Milan’s Triennale for Fuorisalone 2017 and the interior design projects by Piero Lissoni for the crossover yacht SX88 and by Citterio Viel for Superyacht 460Exp. The projects selected, as well as the ones that will be chosen for the ADI Design Index 2019, will be part of the preselection thanks to which ADI’s Compasso d'Oro award will also be attended, the forthcoming prestigious award ceremony that has brought the best designers and brands of Italian design to the attention of experts and of the general public for more than sixty years. Selected for the category Exhibition Design, the installation “Il mare a Milano” has been designed to let viewers immerse themselves in the world of yacht design: the area in front of Milan’s Triennale has been transformed into several alternating seas, by using a great floor projection, reproducing an ideal sea crossing. 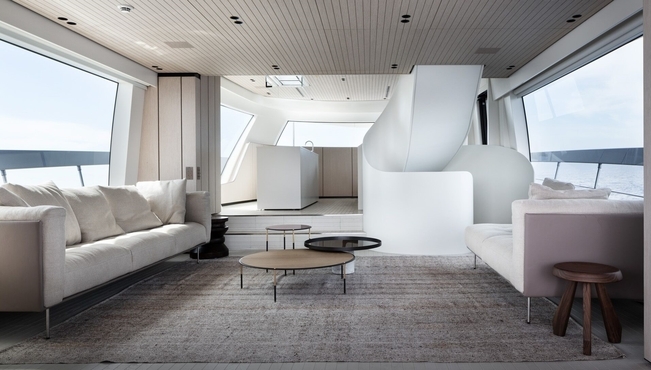 The installation also involved the internal areas of the foundation where an entire room was dedicated to presenting some of Sanlorenzo’s great families of yachts and its collaborations with Dordoni Architetti, Antonio Citterio Patricia Viel and Piero Lissoni. An immersive experience into Sanlorenzo’s dimension. Piero Lissoni, with his absolutely groundbreaking approach for the interior design of SX88, has presented an open space on board an 88-foot long yacht for the first time ever. Piero Lissoni has thus reinterpreted the concept of space on a boat, which develops as a single, continuous ambiance from bow to stern with an open kitchen, next to a dining room, followed by a living area, with no interruptions between interiors and exteriors, thanks to large glass windows overlooking the sea. A “social” boat which suggests a new way of living on board. Sanlorenzo’s superyacht 460Exp, with its interiors signed by Citterio Viel reinvents the concept of explorer yachts. A peculiar feature of this project is surely the strong bond between internal and external spaces. Designers have actually tried to fit the hull into the boat, while preserving the direct relationship between the boat’s structure and its areas. The project aims at revealing the essence of the boat’s construction. The ecru fabrics combined with the leather navy and satin-finished steel details create a sophisticated, cosy, inviting marine setting. Three different projects describing Sanlorenzo’s unique approach, its strong connection to the world of design and the company’s work to propose new ways to experience the sea, introducing new perspectives for the world of boating. Apart from this important recognition, the projects selected will be showcased in the exhibition ADI Design Index 2018, set up in two exclusive locations, Milan’s Museum of Science and Technology and later, Rome’s “Casa dell'Architettura” of the Roman Acquarium. For nearly sixty years, Sea Ray has inspired generations of boaters’ most remarkable experiences. Sea Ray’s Fort Lauderdale International Boat Show display will allow enthusiasts to celebrate and explore Sea Ray’s bold commitment to crafting the next generation of exceptional adventures. Sea Ray is introducing the world to boating technology that brings your boat into the palm of your hand with the launch of Sea Ray Connect. Powered by Nautic-On technology, Sea Ray Connect provides peace of mind by effortlessly conveying a boat’s location and status of vital systems to users via a smartphone app. Boaters will be able to remotely view the condition of their boat’s key components, receive alerts and share diagnostics with service providers should any system require attention. Clouds couldn't dampen the spirit of Viking's 2018 Employee Appreciation Day. With a crowd nearing 3,000, Viking's boat builders and their families savored an autumn day filled with food, friends and fun. This day, dubbed The Clambake, is all about the Viking shipwrights. Headed up by the Human Resources Department, over 100 managers, administrators and staffers pitched in and worked the event for the team building the boats in the manufacturing plant. Shucking clams, grilling burgers, roasting pigs, pouring sodas, running kids' activities and even twirling cotton candy are all jobs manned by the Viking crew. It's Viking's way of thanking its family for building the best boat in the world. The Viking Yacht Company is proud to have the strongest dealer network in the world. To maintain that esteemed position, Viking is committed to investing in its authorized dealers. Throughout the year Viking invites its dealer principals and sales representatives to its first-class New Jersey manufacturing facilities. They spend a few days with Viking onsite for interactive, hands-on training as well as classroom-style education. The Viking Sales Department hosts this Master's Program and takes the teams through the build process, discusses new technology and demonstrates features unique to the product. It's also a great opportunity to receive feedback on the Viking boats so to continue building a better boat every day. A team from HMY Yacht Sales recently attended the program. The Viking 62 Hazel Ann smacked 15 sailfish at last weekend's Presidential Aruba Caribbean Cup. This was a record-setting event with 109 billfish releases in three days of fishing with just 16 boats. Monaco Yacht Show provided a glamorous setting for RINA to present some ground breaking awards to Wider for the construction quality of the 165 superyacht “Cecilia”. The first award related to the remarkable lack of noise and vibration achieved on the yacht, a trademark of the advanced serial hybrid propulsion system that Wider have become known for. For the first time ever, RINA have awarded a perfect 100,100 in their Comfort Class for two consecutive yachts: the first one being the Wider 150. This Comf (Y) 100,100 annotation is a testimony not only to the benefits of Wider’s propulsion system, but also a tribute to the engineering and craftsmanship that has made Wider world leaders in their class.In addition to the Comfort Class Award, RINA also bestowed upon Wider 165 the RINA Platinum Green Plus Award. This Award is recognition of the fact that the Wider 165 surpasses every other yacht in her class for her green credentials. Fuel consumption and the impact of her construction upon the environment were taken into careful consideration. This Award too was given for the second time to Wider, and is an important step in cementing her position as a revolutionary yacht builder for the 21st Century. Moreover, as the icing on the cake, RINA awarded Cecilia with the RINA Award 2018, given to the “greenest” yacht of the year! The Blue Game restyling continues and after the BG62, the North Italian boat builder headed by the Luca Santella presents the new BG42 model. A restyling of the BG40 model which launched in 2011, the new BG42 model presents restyled exterior lines, and a reinvented interior all done from the hands of designer Zuccon. For the exterior Zuccon reinvented the hard top creating a more aggressive design, with a shear-line now having a smooth up transition. Inside Zuccon replaced the the two twin midships cabin of the 40 with a large double berth located at midships. The new Bluegame BG42 also reinvents itself for the propulsion now powered by twin Volvo engines 435hp engines with IPS pod propulsion. After numerous request from its client base all requesting a twenty meter live above explorer yacht Clipper present the project for another Cordova 65. Packed with blue water cruising, this Cordova 65 is a totally different project to the one presented in 2011 and is designed by Patrizio Facheris. The new Corodova 65 project is more modern looking design. The Cordova 65 impresses for its standard list from gyro stabilization, hydraulic thrusters, up down swim platform, colored hull paint, chilled water air conditioning, fully automatic water maker, C-Zone touch screen system control all packaged in a contemporary open plan European styled explorer yacht. Plush soft furnishings adorn the walls and state of the art engineering throughout the stand-up engine room and lazarette. The Cordova 65 can be chosen in a four cabin plus kids aft cabin, or three cabin with guest island bed. The Cordova 65 has the option for an aft beach club layout making the transom and swim platform the focus at anchorage. The 65 Cordova boasts a spacious outdoor living and entertaining area in the open flybridge. She will also be available as an enclosed flybridge version for those who prefer a climate controlled environment out of the weather. It’s now possible to have it all with sensible, practical and safe blue water cruising in proven hull and drive configuration, yet wrapped in a timeless, modern and breathtaking exterior profile. The Clipper Cordova 65 will be standard powered by twin Cummins 550hp engines, or optional 600hp Volvo's. Ocean King continue to expand and after launching the Custom 40m earlier in the season, presents the semi custom Classic 100. 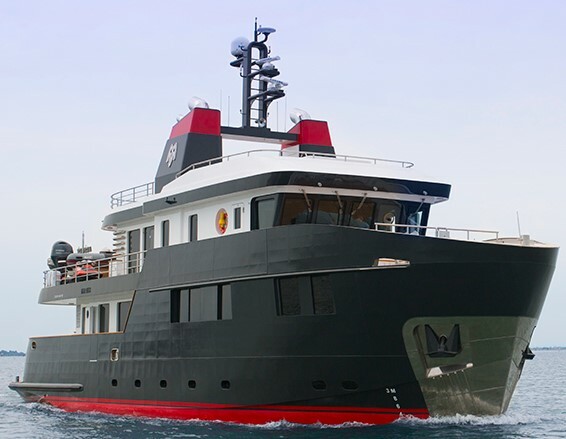 A triple deck explorer yacht inspired design for the Classic 100 Cantieri Navali di Chioggia gave duties to InNave design from Venice. The Venetian designer presented a muscled look design and content since the Classic 100 is build of steel. The Ocean King 100 will feature guest accommodation for ten in five en-suited cabins all located on the lower deck. Crew accommodation is for six to seven persons in four cabins including a captains cabin behind the pilot house on the upper deck. The Ocean King Classic 100 is powered by twin Man 738hp which give top speeds up to thirteen knots. CRN, one of the most famous super yacht builders and Ferretti Group’s brand specializing in the construction of super and mega yachts, is about to create a new masterpiece. The Ancona-based shipyard has indeed announced the sale of a new 62 meter fully-custom super yacht, the shipyard’s hull no. 138. The new project has been developed by CRN’s engineering department in close cooperation with the Dutch design firm Omega Architects by Frank Laupman, who are taking care of the exterior concept, and with the Italian architecture and design firm Pulina DNA, in charge of interiors. Characterized by sporty and sleek exterior lines number 138 by Omega Architects distinctive racy design feature, are matched by the Ancona builder fully-custom build combined with the large size, impressive performances, and the infinitely small, in the form of precious, functional details. The sale of this 62 meter vessel is yet another success stemming from CRN’s long-standing cooperation with Omega Architects, which, in 2014, had already led to the creation of an iconic yacht like the 73-metre. CRN is currently building three other super yachts from fifty to 62 meters. Founded in 2011 as an independent company and making a short stint alone, Belize which today makes part of Riviera, presents its new flagship, the 66 Sedan model. Set to debut in the coming Fort Lauderdale 2018 boat show, the Belize 66 Sedan is an interesting mix of traditional looks and latest interior comforts. The Belize has a lot of space for its 21 meters overall length, thanks mostly to aft located engines and IPS pod drives. The interior layout is offered in eight lower deck layout choices from the standard four double cabins, to three double cabins, and an optional crew cabin located at midships between the engine room and midships owners stateroom. In all the layouts what does not change is the owners full beam midships stateroom, and the forward VIP cabin position. But the owner stateroom is full of options, from a large shower head located further astern in replacement of the utility room or crew cabin, office choice in replacement of the fourth cabin, or a shower head again in replacement of cabin four. The main deck of the Belize 66 Sedan offers a modern layout with an astern galley, L-shaped sofa which can be used both as relaxing settee or a dinette. The helm station is central located and features driver and companion settee. Power for the Belize 66 Sedan is from twin Volvo 1000hp with IPS pod propulsion. If you are looking for a sport cruiser with a lot of substance to its sea keeping ability and an efficient fast hull there is not much in beating Icemarine Bladerunner 45 GT. This project is based on a triple stepped air entrapment mono hull shape which started its conception in 1975 as a race boat, and made its first production turning point in 1998. The Bladerunner 45 GT designed by Lorne Campbell and launching in 2018 is a follow to the racing success of the Bladerunner 35 series, with the added bonus of luxury accommodation inside, offering a two cabins four berth interior, galley, L-shaped sofa, and shower head. Outside the Bladerunner 45 GT offers a race inspired design mixed to that of a sport cruiser, with an aft sun-pad, and two style bench sofas which when desired convert to a dinette. The Icemarine Bladerunner 45 GT will be powered by triple Volvo 370hp engines with top speeds estimates up to fifty knots. Princess present the new V50 Open, a further development of the V48 launched in 2015 and featuring the Plymouth British boat builder latest dynamic exterior design. The new V50 to the V48 adds Princess latest large hull side windows, and a larger extended bathing platform aft. 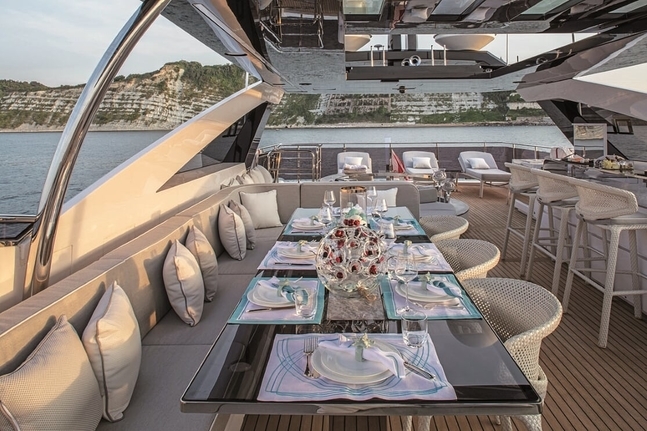 In the Princess V50 the main deck configuration features a sunpad aft leading to a dinette to port side, with wet-bar and helm station opposite. Innovative flexibility continues to the well-appointed lower deck saloon which can be used as an entertaining space or optionally converted to a double berth. There is the added option of specifying this area with a third cabin. The full beam midships master stateroom is an inviting sanctuary whilst the forward VIP cabin enjoys the option of scissor berths. The Princess V50 Open is powered by twin Volvo 435hp with IPS pod drives giving top speeds up to 32 knots. Absolute continues to expand its Navetta line, and after presenting the 48 Navetta in 2018, new entry level model of the range, the North Italian boat builder is looking for a second in size 68 Navetta for its popular semi planning yacht and cruiser range, set to launch in 2019. The Navetta 68 will be just five feet smaller to the current Absolute flagship, and will have spacious interior spaces, and size record breaking exterior ones. Indeed on plan the Absolute Navetta 68 seems to offer among the most spacious flybridge in its size, and it does not seem to stop there, interior spaces are abundant. The lower deck of the second in size Navetta will feature a four double cabins three head layout, which in a certain sense break the mold, featuring a midships full beam VIP suite, and a forward owners stateroom. The Absolute 68 Navetta will be powered by twin Volvo 900hp engines and as all the models coming from Piacenza is to be powered by forward looking dual propeller IPS pod drives. Fiart presents the new 34, a model which is a modernization of the 2006 launched 34 Genius. The changes of the new 34 versus the previous Genius sister, come in a re-invented future looking radar arch, the addition of large hull side windows, and re-invented helmsman dash able to accommodate two large navigation screens. For the remaining, and thank Fiart for that this 34 is the same and offers the same very much liked Mediterranean features. From the single floor flash cockpit deck, with one of the best exterior galleys in its size, and a spacious interior offering two cabins; owners forward, guest cabin to aft, and an extra two berths available by converting the C-shaped dinette. The new Fiart 34 is powered by twin Volvo 260hp with stern drive propulsion. 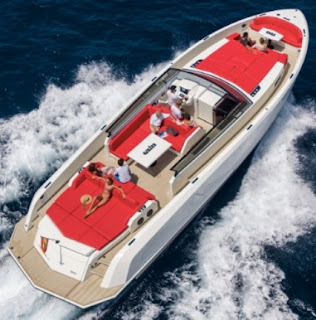 Just over ten years after its launch the Fiart 34 is still today among the most Mediterranean focused sport cruisers in its size for using simple yet clever characteristics. Airon Marine presents its new World wide web showroom. Airon Marine by Paolo Molinari is one of the boat builders which reside on the Lake Como, a hub for some of Italy's finest medium size sport cruiser builders. The story of Airon Marine started in 1976 when Paolo Molinari at the time aged 25 years builds a 36 feet wooden boat in collaboration with Walter Posca. It is the start of a journey which today sees one of the few semi-custom builders offering medium sized cruisers. Today Paolo Molinari is joined by his sons Camillo and Tommaso. Airon Marine currently offers fourteen models, divided into a four range series; AMX, Sport Cruiser, Walkaround Fisherman, and Hard-Top Coupe. Airon entry level model is the 235 of the Sport Cruiser range, and go up to the 5400 T-Top project. Airon Marine latest 2018 model is the AMX 28 Woodline. Versatility is key to any Airon Marine and for example one of its most popular models the 4300 T-Top is offered in four different lower deck layouts. The same is to be said of the 4700 T-Top, while the 4100 T-Top has three lower deck choices. Airon Marine new website is available in Italian, English, French, and German languages and a Menu on the right top corner takes you around with the following buttons; Home, History, Service, Models, Used Boats, Custom, Dealers, News, and Contacts. Tecnomar has recently launched the Evo 120 model. Third model of the Evo range to go into the water following the sale and delivery of the two 55 versions open and hard top. Designed by Gian Marco Campanino the Evo 120 strikes itself for its unusual futuristic exterior design. Completely build in aluminium the first unit of the Tecnomar Evo 120 sold to a Far East client featured a four double cabins interior. Power for the Tecnomar Evo 120 is from twin MTU of 2600hp which allow top speeds up to 22 knots and a cruise of twenty knots. Tankoa Yachts has revealed the latest version of hull S801, the innovative eighty meter project styled by Francesco Paszkowski. The announcement comes after a series of significant launches and new orders for the Genoa-based yard. Tankoa has launched three super yachts from the famed seventy meter Suerte C101 in July 2015, to S501 in May 2017, and hull S701 this Summer 2018. The sophisticated design and engineering of S801, destined to become the flagship of the Tankoa fleet, is approaching completion. Once finalized, it will provide the platform for the brand’s super yacht range from over eighty meters. The restyled Tankoa S801 is based on an 80m technical platform with a 13.5m beam and a volume of approximately 2500 Gross Tonnage. The first section of the main deck will be full beam in order to provide the maximum interior volume. The layout has been developed on five deck levels, including the sundeck. The main deck features an enormous salon with five VIP suites with ensuite facilities located forward to ensure optimal acoustic comfort. The extensive owner’s apartment occupies the forward section of the upper deck and comprises the master stateroom with two walk-in wardrobes, a palatial bathroom, massage parlor, private sauna and personal studio. This is just a taste of the general arrangement of the S801, as naturally the shipyard is at the disposable of individual owners to customize the layout according to his or her wishes. Inspiration for the exterior styling, which appears to float between the sea and sky like sails in the wind, came to Francesco Paszkowski after seeing the Amerigo Vespucci, one of the most famous tall ships afloat. 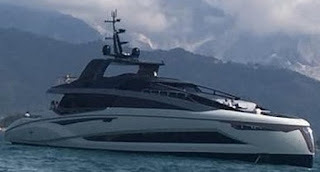 In fact, the various deck levels appear suspended, breaking up the superstructure and giving the impression of airiness and lightness rare for a yacht of this size and volume. With S801’s high-tensile steel hull and superstructure of aluminium and other lightweight alloys, Tankoa Yachts is setting out on a trajectory to develop a yacht that will be among the most innovative projects of its kind in terms of aesthetics, construction and technology. The engineering design, on-board systems and other technical specifications are entering the final stages. Tankoa S801 is to be powered by twin Cats 2682hp which will deliver speeds up to 16 knots and acruise of fifteen knots, with an economic long range of twelve knots delivering autonomy for up to six thousand nautical miles. Sanloenzo continues to push its synthesis between the motor yacht and a modern explorer type ship, and expands its 2017 launched SX line with the second SX76 model. Presented as the SX72 project in early 2018, the SX was during project stages expanded to become the 76 model. Designed by Bernardo Zuccon the SX76 has sold eight hulls up until the Cannes 2018 boat show, showing a continued success from the SX88 which since its 2017 World preview has sold thirteen units, three of which delivered. 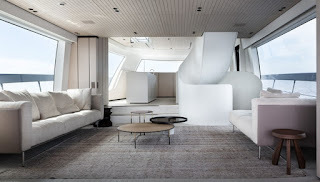 Hull one of the Sanlorenzo SX76 featured special interiors by Pierre Lissoni. But do not be mistaken the Sanlorenzo SX76 which currently is the entry level smallest yacht on offer from the Viareggio La Spezia boat builder, has standard more conservative versions. 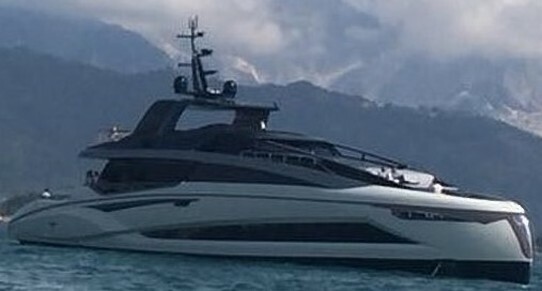 Indeed as any Sanlorenzo the SX76 is a fully semi-custom product and this is shown with the various layout choices offered; two for the flybridge deck, three for the main deck, two for the lower deck, and other couple of details for the owners midships master cabin and the dinette on the main deck. The SX76 brings exciting times for a customer looking for a semi-displacement modern type explorer yacht, and competes with the likes of the Magellano 76, and Absolute 73 Navetta, with the offer from Sanlorenzo offering that extra step up for luxury, quality, and customer choice. Dave Christensen, who founded the Christensen mega-yacht business in 1983 in his hometown Vancouver that catered to the rich and sometimes to the famous, died Monday evening, 15th October at the age of 87. Christensen, who’d been afflicted with Alzheimer’s disease, died at an assisted living home in Vancouver surrounded by his three daughters. Christensen built his first fortune as a home builder and then real estate developer, choosing to retire at age 50. As a retirement gift to himself, he commissioned a 95-foot-yacht to be built at Westport Shipyards in Washington. At the conclusion of its maiden voyage to Mexico, Christensen decided he could build a better yacht, and that’s how Christensen Shipyards got its start. Christensen was born on June 19, 1931, on a Flaxton, N.D., farm, the eldest of three children. His father, John Christensen, also owned a Red Owl grocery store in Flaxton, a community in the northeast part of the state that had 66 residents in the most recent census. Christensen’s mother, Madeline Clauson, was a school teacher who later became a homemaker. When Christensen was 12, his father died in a tractor accident. His mother chose to move the family to Vancouver in 1943 to be near relatives. The family joined many others flocking to the city to work at the Kaiser Shipyards. His mother didn’t take a job in the shipyards, however, working instead in a variety of roles for Wolf Electric Home Supply and later as a photographer for Meier and Frank. While Christensen floundered at Hough Elementary School and later the old Fort Vancouver High School at Fourth Plain Boulevard and Main Street, he flourished at work. By age 23, Dave Christensen was building houses. In addition to believing he could build a better boat, Christensen also once said in an interview that he thought retirement might be boring, and that’s part of the reason he started the yacht business in 1983. His yachts, with their composite shells, were known for an opulence that attracted the likes of golfer Tiger Woods and country singer Jimmy Dean, perhaps better known for his sausage. It was a rare customer who’d allow their identity to be known, reflecting the reticence to be associated with a multi-million-dollar, made-to-order purchase. Christensen Yachts built super yachts at average length of forty meters. The company expanded in 2006, building another plant in Tennessee. In 2009, Christensen stepped away from the business, leaving its leadership to a stepson. Currently Christensen has two super yachts in construction, one set to launch later this year,and another in 2019. Dave Christensen is survived by his wife, Mary; daughters Kathy Maynard of Vancouver; Teri Kelly of Roswell, Ga., and Cindi Curtain of Vancouver; stepsons Riccardo Foggia Jr. of Lake Oswego, Ore., David Foggia of La Grande, Ore., and Joseph Foggia of Fort Lauderdale, Fla., seven grandchildren and seven great-grandchildren. The Vanquish VQ54 with its tender garage has been well received throughout the world. The convenience of an on board tender is immediately obvious when going to shore to pick up or drop off passengers or run an errand. Despite its length, this aluminium model is highly agile and has the power to accelerate very quickly. The double spray rail keeps the occupants dry even at very high speeds, and the hull guarantees incomparable cruising comfort. To meet the needs of those wishing to accommodate more guests overnight, a new layout has been designed with an additional extra comfortable cabin for two people partly with standing headroom bringing the total overnight capacity up to four. A second new option is to also add a third cabin for a crew member. Together with the substantial amount of space on deck, which can accommodate up to twenty people, and the extensive bimini opportunities, this VQ54 with the new layout makes it a sport yacht more ideal for longer weekend trips. Alberto Mancini Fairline era continues to expand and after the launch of his first fully designed Targa 63 Open, here comes act two with the much awaited Targa 43 Open, new entry level sport cruiser of the British builder since the mid eighties started sport cruiser and yacht line. A very spacious sport cruiser which goes one meter more in size to its declared 43 moniker, the new entry level Targa Open impresses for a spacious full beam owners cabin, and detailed choice which can make life on-board more pleasant. Choice revolve around choosing owners cabin forward or midships with the guest or day head moving forward or upon entry. The Fairline Targa 43 Open also features a tender garage under the aft sun-pad able to accommodate up to a 2.80 meter size mini jet rib. The Fairline Targa 43 Open is powered by twin Volvo 435hp engines with IPS pod propulsion and top speeds estimates up to 32 knots. After the success of the 43 and WA models, Evo Yachts is looking forward to expand its range not only on its now popular thirteen meter platform, but also for fully new and bigger models. Enters the Evo Yachts R5, a project for a t-top style sport yacht which aims to take the footprint and features of the 43 model into a bigger fifteen meter plus size. So far Blu Emme the company who owns and founded Evo Yachts in 2015 with the introduction of the 43 and the Rivellini design team is not giving much details about the R5. What we can say is that like its smaller 43 sister the R5 is full of minimal modern design, and will have the technological innovation which made the small Evo Yacht famous. The new Dreamline DL 35 made its World debut at the 2018 Cannes boat show, and offered another example if there ever was needed one of the Fano Super Yacht builder ability to combine exclusive Made in Italy excellence. Created by Team for Design’s Enrico Gobbi in partnership with the Dreamline Technical Department, with exceptional performance delivered by the hull developed by Giuseppe Arrabito of Arrabito Naval Architects. With full custom interiors, like all Dreamline Yacht projects, the distinctive features of this boat are the clean, flowing exterior styling and the elegant and spacious interiors, where the sophisticated use of mirrors gives the sensation of even more space. Innovative technology and build quality are among the key characteristics of the new Dreamline 35, which as well as retaining the winning features of the range’s 26-meter entry level model, like the owner’s suite with panoramic views, stands out for all the innovative design details that provide unexpected levels of comfort for super yachts of this length. They include efforts to reduce noise and vibration to a minimum at any speed and everywhere on board. This provides the captain with a bridge wing for use in tight spaces, without sacrificing the full set of helm station controls. This choice was driven by the need expressed by captains to have bridge wings that extend further outwards, combined with the search for effective solutions that are both practical and aesthetically pleasing. Peter Zuber, the founder of the company and the inspiration behind the entire Dreamline philosophy, has also devised solutions that offer a new take on various areas of the boat and make even more of the available space, like the full custom gangway that adapts to any quay height, or the balconies, or the foldaway components that increase the outdoor surface area still further. The Dreamline DL35 is a full custom build, like all the units built by the shipyard, meaning that owners can not only choose the decorations and materials, but also alter certain parts of the superstructure to satisfy their desires, needs and habits, whatever they are. The outdoor areas provide plenty of space for sunbathing and relaxation, as well as a dining area and a swimming pool, while the interior decoration is the result of a carefully selected combination of unique pieces and works of art. The chair and sofa upholstery and the curtains are silk velvet by Armani Casa. The bathroom decor makes extensive use of Portoro, a highly-prized dark-colored marble, while every setting features a sophisticated combination of refined color tones and materials, the most important being: white onyx used for visually striking tops, fine leather with visible stitching to clad walls and certain doors, and satin-finish steel. 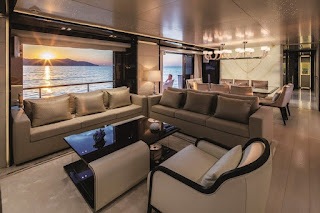 Every detail of the boat is designed to guarantee aesthetic and functional standards at the very highest level; the real leather cladding on the doors of the two VIP cabins and surrounding wall ensures perfect soundproofing while conveying considerable aesthetic appeal. The owner’s cabin has an automatic door that is hidden inside the structure when open, so that it doesn’t block the side passageway. The big glass door separating the cockpit and lounge opens up to form one big space. Every detail of the layout is designed to convey the sensation of being on board a big yacht with wide open spaces to enjoy. The extensive windows and multiple glazed surfaces establish close contact with the marine environment. The lobby amidships with dining area, the main lounge, the day bathroom with direct access from outside, or the port-side fly-out balcony are all features normally found only on ships over fifty meters in length. The full-beam owner’s suite on the Main Deck features two large rectangular glazed surfaces, plus two windows in the ceiling that flood the setting with unprecedented light. The guest night area on the lower deck comprises four cabins with en-suite bathrooms, including two VIP cabins amidships. The crew quarters, which occupy the entire forward section of the hull and have been designed to ensure that guests have the utmost privacy, consist of the captain’s cabin with its own bathroom, plus four more beds in two cabins and another bathroom. The propulsion system features a pair of MTU 1920hp engines as standard or, optionally, two different units from the same manufacturer but with a high rating of 2,600hp each. At a speed of ten knots, the Dreamline DL 35 has a remarkable range of 1,800 nautical miles.